Caesar Augustus is usually called the first Roman emperor, but his fortune depended on his adoptive father Julius Caesar. 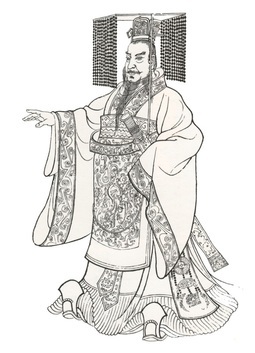 Shihuangdi 秦始皇帝, literally First Emperor, is the unambiguous founder of imperial China. These three men were all great imperial conquerors. Their political achievements were even more important. They instituted similar centralized monarchies to govern the enormous territories, brining prolonged peace to lands ravaged by centuries of war. In the process, they destroyed the old form of government: a republic in the West, feudalistic parceling of sovereignty in the East. The creative destruction antagonized the old ruling classes, senatorial aristocrats in Rome and, in China, feudalistic aristocrats and their ideological heir, Confucians. The resistances were fierce. Caesar was assassinated. 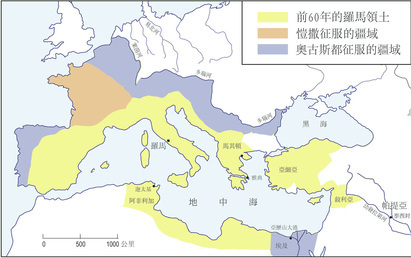 The First Emperor escaped three close-call attempts, but his Qin Dynasty fell shortly after his death and his posthumous reputation did not escape assassination. 3. 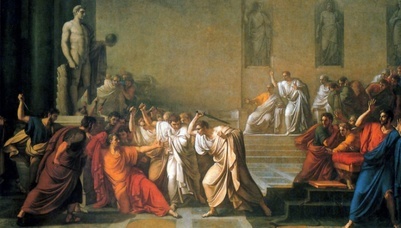 The assassination of Caesar. 4. The attempted assassination of the First Emperor. Caesar destroyed the Republic in a civil war, but offered no durable political institution to replace it. This had to wait for his heir Octavian, who won another round of civil war to become Augustus. In contrast, the First Emperor established the political architecture of imperial China, which would last for more than two millennia. 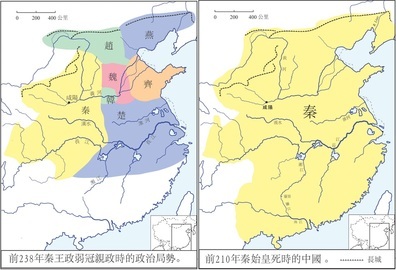 Augustus and the Han Dynasty that succeeded Qin were more successful in compromising with the elites, Roman senators and Chinese literati-officials, whom they made junior partners in lording over the common people. 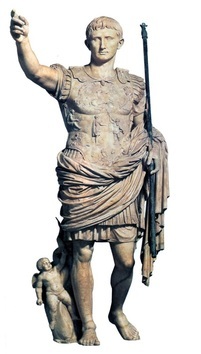 A contemporary statue of Augustus. (Musei Vaticani, Rome). The outstretched right hand is a gesture of authority, part of a standard artistic motif called anadlocutio (giving a speech), seen in many works, for example the equestrian statute of Marcus Aurelius. 6. The First Emperor of China. The ancient Chinese left no image of themselves. Later artists produced many imaginary “portraits” of the First Emperor with no resemblance to each other. This one, probably the most popular in Chinese literature, strikes a curiously Roman posture unseen in the “portraits” of subsequent emperors. Augustus and the First Emperor each projected his image of an ideal emperor in writing. A few months before his death, Augustus wrote his Res Gestae (Achievements), which was placed on bronze tablets in front of his mausoleum. Unlike Chinese rulers accustomed to hiding in palaces, the First Emperor diligently toured the country to inspect conditions on the ground. He left stone inscriptions on various mountains he ascended, publicity more attuned to the Romans than the Chinese. The texts of both emperors survived. Physical remnants suffered the ravage of time. A detail showing the first lines of Augustus’ Res Gestae, from the temple of Augustus and Roma, Ankara. 8. 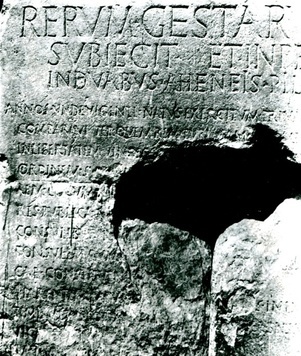 The First Emperor's inscription. 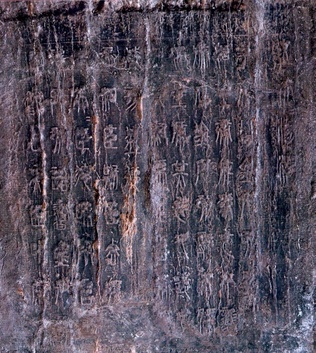 A surviving part of the First Emperor’s stele erected on Mount Langya, Shangdong.